Gov. 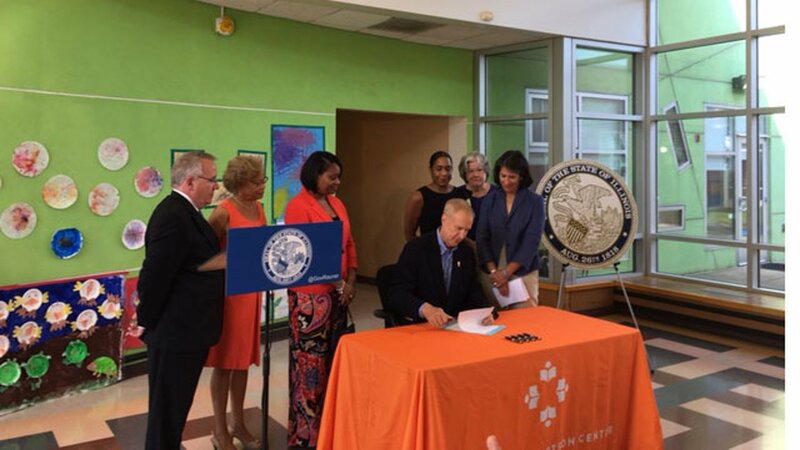 Rauner signed HB2663 in Chicago on August 14. CHICAGO (WLS) -- It's hard to imagine preschoolers being expelled from school, but Governor Bruce Rauner took steps today to make sure it never happens in Illinois. Rauner signed new legislation Monday that prohibits the expulsion of students from preschool education and early childhood programs that are funded through the Illinois State Board of Education. The bill, HB 2663, also requires the Department of Children and Family Services (DCFS), in consultation with the Governor's Office of Early Childhood Education and the Illinois State Board of Education (ISBE), to develop rules to prevent licensed day care and similar institutions from expelling young children for exhibiting challenging behavior. Research suggests expulsion and suspension have negative educational, health and developmental outcomes for children. Federal education data from 2005 shows three times as many Illinoisan preschoolers are expelled than students in grades K through 12. More recent studies suggest that boys and African-American children are most likely to be suspended or expelled. "Our children are precious, and we must do everything we can to give them the tools they need to grow and succeed," Gov. Rauner said. "It's our duty to make sure all children, especially the most vulnerable, receive a quality education starting at a young age. I'm proud to sign this bill, which will provide teachers the tools they need to address challenging behavior so expulsion isn't necessary." Early childhood advocacy organizations, including the Ounce of Prevention Fund advocated for the passage of HB 2663. "HB 2663 and the programs it would support can serve as a model for nationwide reform of expulsion criteria in early childhood settings," said First Lady Diana Rauner, president of the Ounce of Prevention Fund. "We must do everything we can to ensure our nation's most at-risk children have access to quality education in the early years, allowing them to have the best chance at success in life." Under HB 2663, early childhood programs must now document the steps taken to allow children who exhibit challenging behaviors to participate in class. If those efforts fail, programs can work with parents to transition the student to a different program rather than resorting to expulsion. Children can still be temporarily removed from class if there are safety concerns. ISBE, DCFS and the Department of Human Services can also recommend training, offer technical support and provide professional development resources to teachers and staff.